The queue of cars in the picture has led many people to think we have a congestion problem. Rather than blaspheme by suggesting the cars are the problem, the tunnel has copped much of the blame. And there are two broad categories of solutions. We could either build another bigger shiny tunnel through the hill to allow for more conjestion, or we could encourage more people to use public transport and to cycle and walk about and thus reduce congestion. ‘I think there are some [things] we have to do,’ she told The Dominion Post. …Ms Prendergast said a new Mt Victoria tunnel should be a high priority, regardless of what submitters to the study say. This section should really be placed higher than public transportation. It is far too common for pedestrian and cycle plans to be placed last in the list of priorities – a gross injustice to the residents of the city. In fact, the draft plan defers any planning for pedestrian and cycle activities for other projects and allocates no funds. Active modes are a vital aspect to a city with a small footprint. Instead of residents taking short trips in a car or on transit, many choose to travel by their own power, using minimal resources, leaving minimal waste and needing minimal infrastructure. Transportation planners must stop impeding active modes. Anyone who has ever walked or cycled through that current tunnel knows its footpath wasn’t put there with pedestrians and cyclists at front of mind. Unless I’m in a real hurry I always prefer to go over or around rather than through the tunnel’s fumes and car honks and general grotiness. 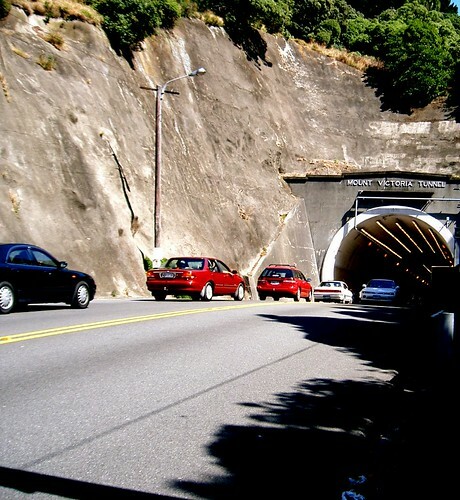 This entry was posted in democracy and appropriate decision making, Ecological wisdom, Wellington and tagged cycling, Mt victoria, public transport, rongotai, tunnel, walking, Wellington by stevedore. Bookmark the permalink. stevedore, Your first paragraph identifies the guts of all transport probelms. It’s a pity you didn’t recognise it and proceeded to identify only two of the three broad categories of .solutions. Your insightful comment was “…people on one side of the hills want to get to people on the other side …” Prendegrast is only pushing for the tunnel option because her council wants to develope a satelite CBD near the airport. Without that there would be no need to allow for more congestion. Mayors always want to solve congestion because the ultimate solution to congestion is for homeowners and businesses to locate to somewhere where there is less congestion. To Nelson or Palmerston North for instance. That’s bad for her city’s economic growth, but it’s good for the other cities. Especially when those other cities are losing nillions from the own economies through the diversion of their citizens fuel taxes to fund the Wellington RLTP. Since triple convergence precludes any permanent solution to peak congestion its pointless building motorways or busways or railways to “solve congestion”.The decongestion simply attratcs more businesses and within a few years you are back where you started. Admittedly you can always add more buses or trainsets, but only if you can get the additional capital to do it, and that has always been where these grand schemes fail. If there isn’t a ribbon to cut politicians don’t want to know about it. I am firmly convinced that our love affair with the car is merely a synptom of our love affair with quarter acre sections. It is possible to have garden suburbs with terraced housing but New Zealanders are simply too set in their ways to accept that reality. The miasma that our low density cities were intended to avoid never existed in the first place but nevertheless we countinue in the belief that low density sprawl is healthier than high density slums. It’s the acceptance of that middle ground that is at the heart of Europe’s walkable cities, and even some Australian and Canadian cities have successfully copied that model. Transport is the only area where I am convinced the Greens are lacking wisdom. Oddly, it is the one area where the Greens are promoting solutions which are at odds with the Theory of the Perfect Free Market. That theory, of course, says that if certain preconditions are imperfect then the free market will act imperfectly. I can see the point about our love affair with suburban sprawl being a big part of the issue. Still, given that our housing is currently in these suburban areas and that is our reality for quite some time, I think the party is right to focus on moving people from space to space using public transport and cycling/walking. I think that further investment in transport options that doesn’t allow for this is very short sighted. While we might need to transform the way housing works within our society, there is a real need to do something proactive now that has the smallest amount of negative impact and I think light rail is a far better option than more cars. A) The southern suburbs aren’t distant urban sprawl Wellington standards. You can fairly easily bike to work from there – unlike Porirua or Whitby or Upper Hutt or Days Bay or etc, etc, etc. B) Housing density is up, and going up further. There are still some quarter-acre sections out there, but most of them have been bobbitted and infilled. Most people in the southern suburbs aren’t living on a quarter-acre section unless it’s on a cliff-face. Your comment provides an argument that may well work against transport proposals linking the further-out urban sprawl – like Transmission Gully. But they do not seem applicable to Wellington’s links to the closer, more densely populated southern suburbs. Yes sadly the Greens are economically illiterate on transport by a long shot. The real answer is road pricing, an AM peak congestion charge around the Wellington CBD would relieve the congestion through the tunnel and make commercial bus services far more viable, and more reliable. Light rail is like a fetish, nothing more than enthusiasm for an extremely expensive solution that is little better than buses. Active modes ARE to be encouraged though, a second Mt Victoria Tunnel should address this, but it should be funded by the congestion charge in due course. Libertyscott – I fail to see the logic. If you congestion charge, then you won’t need a second road tunnel, because the congestion charge will reduce the traffic through the existing tunnel by encouraging commuters onto public transport.. If you are going to apply a congestion charge, then it would be far better applied to investment in light (or heavy) rail. The advantage of rail is that it runs on a dedicated track, so nothing is likely to hold it up. Congestion is not the only thing that holds up buses – a small motor vehicle accident or flooding will cause bus services to grind to a halt regardless of the volume of traffic on the road. I saw this myself this morning, as I was walking to my train to get to work. There was the bus (which incidentally and stupidly almost duplicates the train route) stuck about 50 vehicles back in a line of traffic held up by a van v truck and the attending ambulance, fire appliance and police vehicles. I’ve been catching the train for a year now, and only twice ever been delayed significantly – once by a signal failure and once by a car v train at a level crossing (which can be eliminated if tunnels and bridges replace level crossings). But why not just subsidise public transport to ensure it cheaper than using cars? That has the same effect as congestion charging, but it does it throughout the day, not just at peak times, with consequently greater reduction in vehicle greenhouse emissions. Oh, but I suppose you would be opposed to that for ideological reasons.